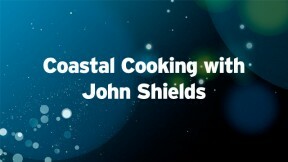 John Shields, of public television's Chesapeake Bay Cooking, embarks on his latest culinary odyssey in Coastal Cooking with John Shields. Over the course of this new 13-part series, Shields explores the cuisine of six United States coastal regions: the shores of the Gulf States, New England, the Mid-Atlantic, the Pacific Northwest, the West Coast and Hawaii. Shields is joined in the kitchen by a guests including Nathalie Dupree, Steven Raichlen and Michelle Bernstein, who specialize in each area's regional culinary and cultural traditions. Organized like a meal, every 30-minute episode features a three informal, yet information-packed recipes, plus an easy-to- prepare snack.